SUBHEAD: How is it in Bashar al-Assad’s interests to provoke a fresh international uproar against him and his regime? Image above: War Criminal Votes. Bachar al-Assad and his wife Asma at a polling place during a recent vote in Damascus, Syria. From (http://www.newindianexpress.com/world/2018/mar/19/syrias-assad-congratulates-vladimir-putin-on-natural-victory-1789486.html). Fool me once, shame on you; fool me twice, shame on me, the old saying goes. So, tread carefully through the minefields of propaganda laid for the credulous in such low organs as The New York Times. There are excellent reasons to suppose that the American Deep State wishes strenuously to keep meddling all around the Middle East. The record so far shows that the blunt instruments of US strategic policy produce a consistent result: failed states. Syria was well on its way to that sorry condition — prompted by an inflow of Jihadi maniacs fleeing our previous nation un-building experiment in Iraq — when the Russians stepped in with an arrantly contrary idea: to support the Syrian government. Of course, the Russians had ulterior motives: a naval base on the Mediterranean, expanded influence in the region, and a Gazprom concession to develop and manage large natural gas fields near the Syrian city of Homs, for export to Europe. The latter would have competed with America’s client state, Qatar, a leading gas exporter to Europe. But the US objected to supporting the government of Bashar al-Assad, as it had previously with Saddam Hussein and Muammar Gaddafi, as well as Russia’s presence there in the first place. So, the US cultivated anti-government forces in the Syrian civil war, a hodgepodge of Islamic psychopaths variously known as ISIS (Islamic State of Iraq and the Levant), Daesh, al-Qaeda, al-Nusra, Ansar al-Din, Jaysh al-Sunna, Nour al-Din al-Zenki, and what-have-you. As it happened, US policy in Syria after 2013 became an exercise in waffling. It was clear that our support for the forces of Jihad against Assad was turning major Syrian cities into rubble-fields, with masses of civilians caught in the middle and ground up like so much dog food. President Barack Obama famously drew a line-in-the-sand on the use of chemical weapons. It was well-known that the Syrian army had stockpiles of chemical poisons. But the US also knew that our Jihadi consorts had plenty of their own. Incidents of chemical atrocities were carried out by… somebody… it was never altogether clear or proven… and Mr. Obama’s line-in-the-sand disappeared under dust-storms of equivocation. Finally, a joint mission of the United Nations Human Rights Commission (UNHRC) and the Organization for the Prohibition of Chemical Weapons (OPCW) was called in to supervise the destruction of the Syrian government’s chemical weapons, and certified it as accomplished in late 2014. Yet, poison gas incidents continued — most notoriously in 2017 when President Donald Trump responded to one with a sortie of cruise missiles against a vacant Syrian government airfield. Image above: War Criminal Votes. 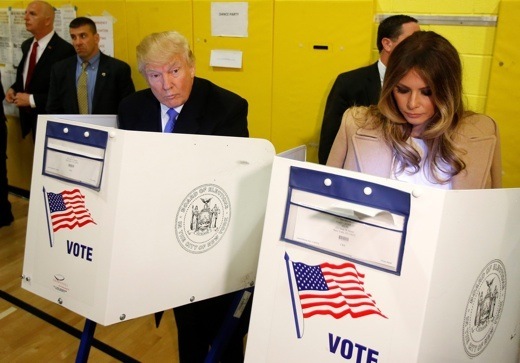 Donald Trump, with his wife Melania, votes for himself at polling place during 2016 Presidential Election. From (https://qz.com/831181/election-2016-how-do-you-write-donald-trump-in-chinese/). And now another incident in the Damascus suburb of Douma has provoked Mr. Trump to tweetstormed threats of retaliatory violence, just days after he proposed a swift withdrawal from that vexing corner of the world. Surely by now the American public has developed some immunity to claims of nefarious doings in foreign lands (“weapons of mass destruction,” and all). Yeah, well, how clear is it that the toxic gas was contained in the bombs, or rather that the bombs dropped by the Syrian military blew up a chemical weapon depot controlled by anti-government Jihadis? Does that hodgepodge of maniacs show any respect for the UN, or the Geneva Convention, or any other agency of international law? As in many previous such incidents, we don’t know who was responsible — though there is plenty of reason to believe that parties within the US establishment are against Mr. Trump’s idea of getting the hell out of that place, and might cook up a convenient reason to prevent it. Lastly, how is it in Bashar al-Assad’s interests to provoke a fresh international uproar against him and his regime? I’d say it is not the least in his interest, since he is on the verge of putting an end to the awful conflict. He may not be a model of rectitude by Western standards, but he’s not a mental defective. And he has very able Russian support advising him in what has been so far a long and difficult effort to prevent his state from failing — or being failed for him.